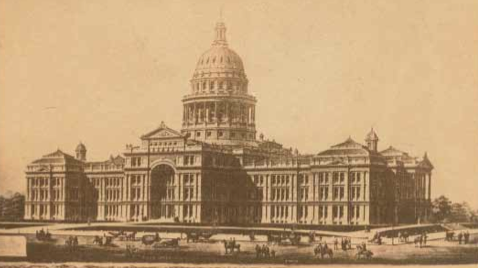 Texas State Capitol, Austin, Travis County, Texas, 1881. E. E. Myers, Architect, Detroit. Lawrence T. Jones III Texas photography collection. Courtesy of Southern Methodist University, Central University Libraries, DeGolyer Library. Je weniger die Leute darüber wissen, wie Würste und Gesetze gemacht werden, desto besser schlafen sie nachts: The less the people know about how sausages and laws are made, the better they sleep at night. Although the wisdom of that saying should warn off most sober-minded folk, some people still need to track legislation[fn]Lawyers use legislative materials to establish “legislative intent.” As described by former Supreme Court Justice Jackson, “The lawyer must consult all the committee reports on (a) bill, and on all of its antecedents, and all that its supporters and opponents said in debate, and then predict what part of the conflicting views will likely appeal to a majority of the court”: quoted in Price & Bitner, Effective Legal Research, 3d ed., Boston, Little, Brown, 1969, p. 56. Other commonly available legal research manuals that teach research methods for establishing legislative intent are: Cohen, How to Find the Law, any ed., Chap. 6; and Mersky & Jacobstein, Fundamentals of Legal Research, any ed., Chap. 10.[/fn]. Of course, lawyers study legal literature. But historians, political scientists, social scientists, and other scholars often need to research the same materials for similar purposes. In democratic societies, major policies are shaped in legislature, and policy implementation, through monetary appropriations or their denial, begins there. It’s hard to imagine any interaction between citizens and their governments that does not involve some legislative influence. Legislative journals provide essential maps to explore the murky turf of lawmaking for that jurisdiction. The word “maps” fits, since only occasionally do the journals themselves provide the material that the researcher is ultimately looking for: texts of bills, amendments, and write-ups; expert, commission, and committee reports; records of hearings; governors’ veto messages; and the like. Direct hits are relatively rare. More often the journals only provide signposts through the trail of complicated political processes. Nevertheless, the journals are often the only source for the essential identifying data that will enable a researcher to seek elsewhere, with sufficient specificity, for the ultimately desired document. Although journals exist for all legislatures in the U.S. and Canada, inclusion of legislative proceedings documentation in online databases has been “spotty and difficult to locate.”[fn]Mitch Fraas, “Legal Databases: Comparative Analysis,” Center for Research Libraries, accessed September 11, 2012, www.crl.edu/collections/topics/legal-databases-comparative-analysis. [/fn] With CRL’s collections as its source, the Law Library Microform Consortium (LLMC) has already scanned a significant portion of this material: the journals for Canada’s federal legislatures past and present, for all of the Canadian provinces, and for fifteen U.S. states beginning with the western region[fn]Digitized content from the following states is now available in LLMC-Digital: AK, AZ, CO, HI, ID, MT, ND, NM, NV, OH, OR, TX, UT, WA, WY. It should be noted that the level of completeness for each jurisdiction in the CRL collections is uneven depending upon how complete a collection was maintained by the original holding library. Once the CRL holdings for a jurisdiction are scanned, LLMC posts a detailed record. This lets other paper-holding libraries consider weeding their entire runs, while helping to fill gaps in the common online collection.[/fn]. As part of CRL’s partnership with LLMC, digitization will continue for other regions of the U.S. Using the legislative journals can be intimidating. Formats differ among jurisdictions, so that skills learned perusing journals of one jurisdiction do not always readily transfer to those of another. However, once scholars become familiar with the organization for a given jurisdiction, use among the volumes generally improves. Annual indexing, although sometimes skimpy, is usually provided. And where the indexing does limp, users of the online versions can resort to full-text searching, a luxury not offered in the paper versions. Learning how to search for nuggets via legislative journals can be as valuable a skill for historians and other “lay” researchers as it is for lawyers. Although tracking is sometimes difficult, and usually only an essential first step in a longer pursuit, an instinct for subtlety and an eye for small clues will aid the successful search. In that regard, another quote, one definitely by Bismarck, may meet the case. “Die Politik ist keine exakte Wissenschaft, wie viele der Herren Proffessoren sich einbilden, sondern eine Kunst”: Politics is not a science, as the professors are apt to suppose. It is an art.